Minster head football coach Geron Stokes, center, has water dumped on him by Jacob Hoying, left, and Luke Puthoff, while being interviewed by Kenny Rhoda following the Wildcats’ Division VII championship victory against Cuyahoga Heights in Canton. 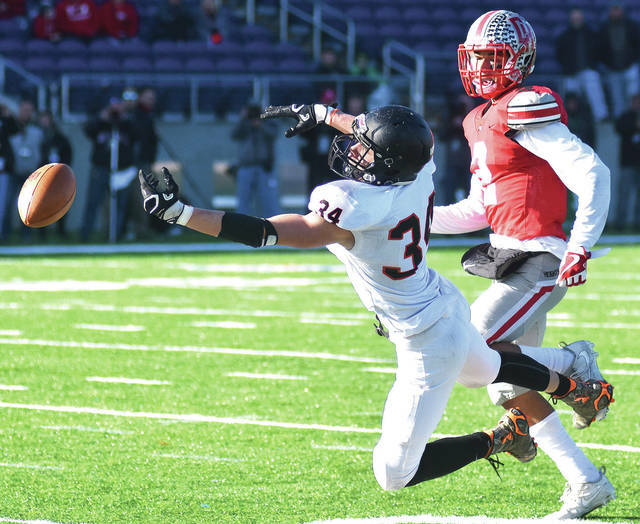 Neither Minster’s August Boehnlein or Cuyahoga Heights’ Dylan Drummond is able to get their hands on a pass during Friday’s Division VII state final in Canton. Cuyahoga Heights’ Max Shafer is unable to prevent Minster’s Jared Huelsman from reaching for a touchdown during Friday’s Division VII state final in Canton. 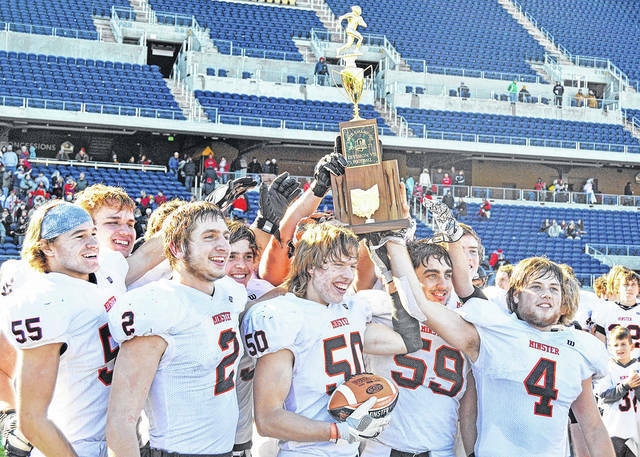 Minster players hoist the Division VII state championship trophy Friday after defeating Cuyahoga Heights in Canton. CANTON — Minster’s offense got rolling in the second quarter on Friday and didn’t stop until Jared Huelsman and other players hoisted the Division VII state championship trophy. After a slow start in the Div. VII state title game, the Wildcats scored two touchdowns in the final five minutes of the first half and ran away in the second to a 32-7 win at Tom Benson Hall of Fame Stadium. 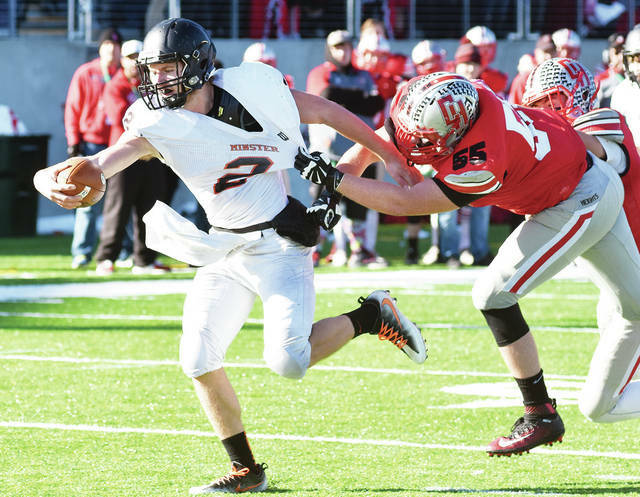 Huelsman, a senior quarterback, directed Minster’s offense in a big way one last time. Huelsman ran for 221 yards and three touchdowns and completed 12-of-20 passes for 141 yards and one touchdown. “It’s just the credit to the O-line getting the holes for me to run,” Huelsman said of his performance. Huelsman was the Midwest Athletic Conference’s offensive player of the year as a junior and had a big season again this year. He finished the season with 2,172 passing yards and 17 touchdowns and 1,838 rushing yards and 26 touchdowns. Huelsman led two scoring drives at the end of the second quarter that gave Minster a 19-7 halftime lead. With a 7-7 tie, Minster drove 94 yards on 14 plays and scored on a 3-yard run by Huelsman. He completed six passes on the drive and had several big runs, including a 7-yard run on a third-and-one at Minster’s 44-yard line. After Cuyahoga Heights had a three-and-out, Minster had a nine-play, 83-yard drive that Huelsman capped off with another 3-yard run. Huelsman had seven runs on the drive, including a 30-yard run that moved the ball to Cuyahoga Heights’ 38. Huelsman’s last touchdown came as time expired in the second quarter. Minster and Cuyahoga Heights called timeouts before the play, then Huelsman ran around the left side of the line and dove into the end zone. Huelsman also had four tackles on defense. Huelsman added a 9-yard touchdown to cap off Minster’s first drive in the third quarter and boost the lead to 25-7. Cuyahoga Heights’ offense sputtered as it tried to rally late in the second half. The Redskins had two drives end on interceptions by Isaac Schmiesing. Alex Lehmkuhl also intercepted a pass early in the fourth quarter to end a 16-play drive. Stokes said Schmiesing’s performance was indicative of the team’s overall improvement after a 3-4 start. Stokes said Huelsman is a true leader and credited his and the rest of the players’ values. Minster has made state championship games three out of the last four seasons. The Wildcats won the Div. VI state title in 2014 and lost in the D-VII title game last year. Minster lost most of its starters off last season’s state runner-up team, and Stokes credited the team’s seniors for stepping up and leading the team this year. Schmiesing scored a touchdown on a short run late in the fourth to put the win away. Minster took a 7-0 lead with 7:07 left in the first quarter on a 44-yard touchdown pass from Huelsman to Austin Brown. The Redskins scored on a 28-yard pass from Ryan Polk to Dylan Drummond to tie the game with 3:36 left. Cuyahoga Heights had 246 yards of offense. The Redskins had four interceptions and had three drives stall in the red zone. Minster finished with 396 yards of offense. Schmiesing finished with 37 rushing yards on six carries, while Brown led the team with 92 receiving yards on seven catches. Lehmkuhl caught three passes for 19 yards, and Schmiesing had two catches for 30 yards. Martin credited Huelsman and Minster’s offensive line for moving the ball against Cuyahoga Heights’ defense. Jacob Hoying led Minster with nine tackles, while Schmiesing had eight. Alec Huber also had an interception. This entry was tagged Minster. Bookmark the permalink.